Société is pleased to present Chinese artist Lu Yang’s first solo exhibition at the gallery. 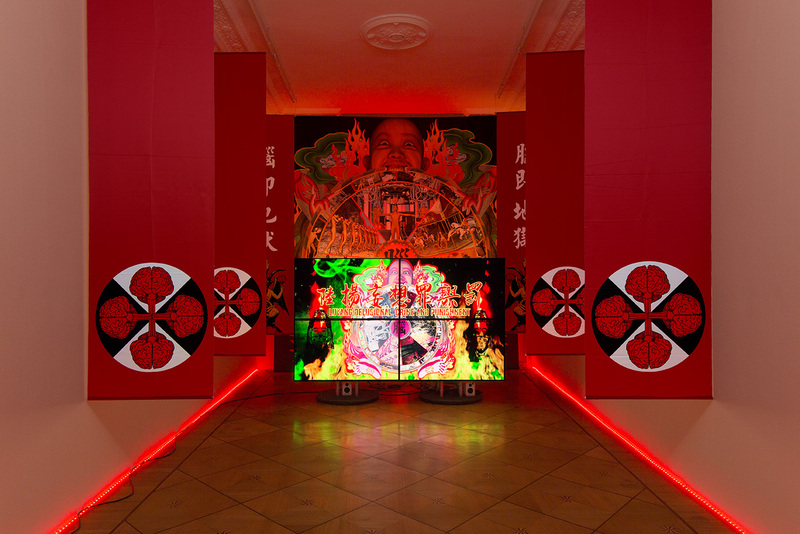 Welcome to LuYang Hell features three installations. 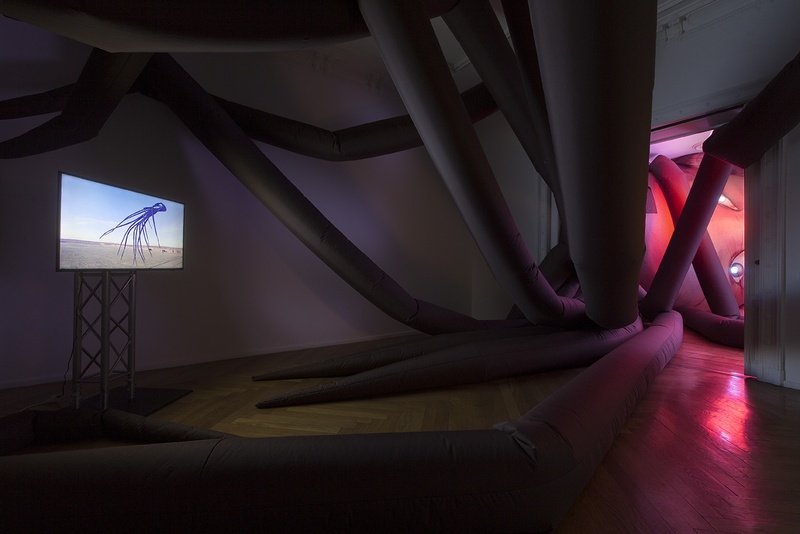 Lu Yang’s multimedia installations combine video, sculptural elements, lighting, and soundtracks made in collaboration with different musicians. The videos themselves are fast-paced, delivering various types of information at once: highly detailed and sometimes intense digital imagery layered with moving graphics, voiceovers also available as subtitles in translation, and high-energy soundtracks ranging from techno to opera to death metal. The installations can be immersive and overwhelming. Viewers are left with strong impressions, but to grasp the videos in all their detail, viewers would probably have to watch them multiple times. Or you can let them wash over you – colorful and keyed-up, like a music video or a futuristic educational film. The protagonist of this video is Lu Yang herself: Her 3D-scanned head has been mounted on a stock CGI body. First, the figure is 3D printed and packaged with the label “Made by God”, then it’s tortured and drawn into hell. Lu Yang brings up the idea that, if humankind was created by a God, our propensity to sin was preordained, and our arrival in hell inevitable. The video invokes various religions’ symbols and mythologies regarding hell. Music by GAMEFACE. The CGI character with Yang’s face returns in this video, a meditation on medicine and technology. Her brain is submitted to a variety of tests discussed in voiceover. The video deals with the idea that technology might elevate humankind. 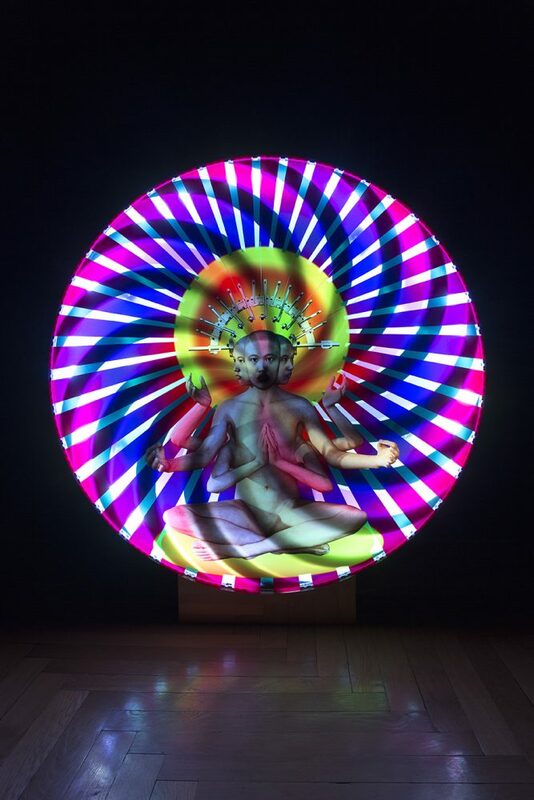 It’s also filled with religious imagery and dancing digital marionettes. Soundtrack by DJ Cavia. 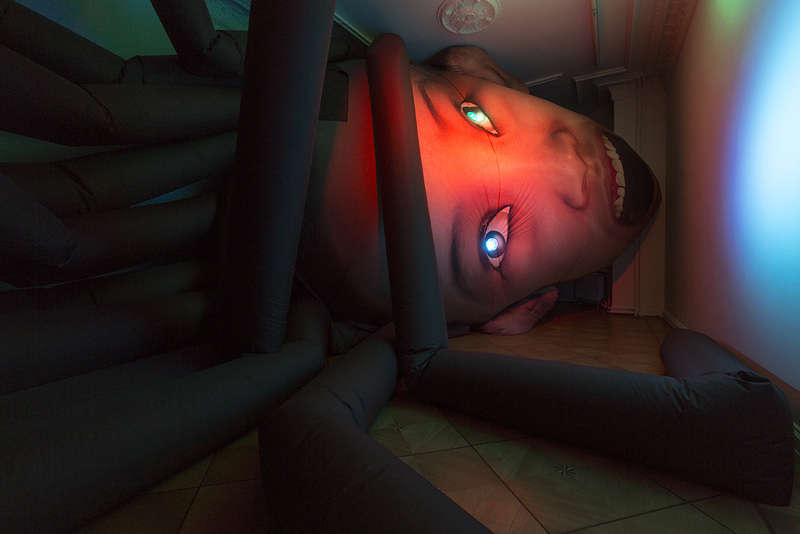 This installation – comprising the balloon head and two videos – incorporates elements of two works: As her contribution to the exhibition “Smart Illumination Yokohama” in Japan in 2016, Lu Yang produced a giant balloon printed with her face – mouth open wide, beams of light erupting from her eyes. At Société, it takes a slightly different form filling two rooms. On one of the two monitors located nearby, viewers will find video documentation of the work set to a soundtrack produced by Yllis. The other monitor shows “Lu Yang Gong Tau Kite”. In 2016 – in Weifang, China – Lu Yang created and flew a giant kite depicting her 3D-scanned face. Her mouth is upturned into something between a smile and a grimace, her eyes are wide, and long strands of her hair snake along in the wind while it flies. The video incorporates footage filmed via drone. Lu Yang was born in Shanghai and lives and works in Shanghai and Beijing. She completed her Bachelor of Arts as well as her Masters of Arts in the New Media Art Department at the China Academy of Art in Hangzhou, near Shanghai. 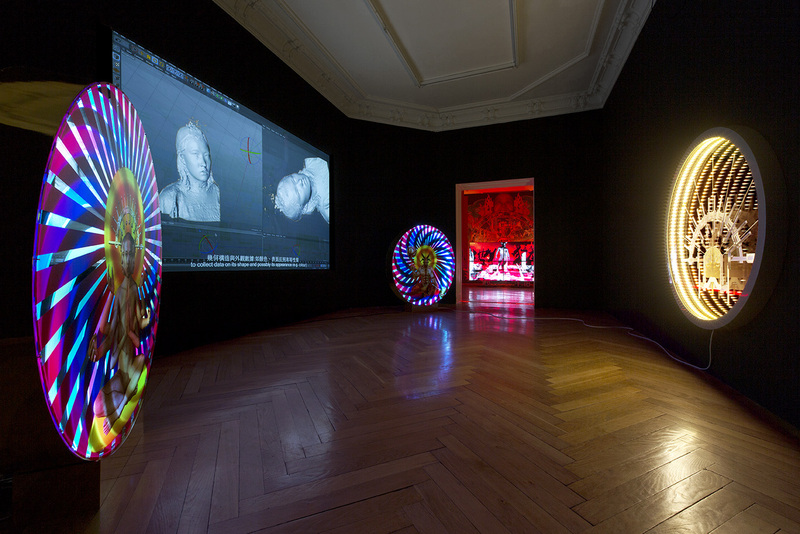 Lu Yang’s multimedia works explore neuroscience, mortality, and religion. Her imagery borrows equally from pop culture, religion, and technology. Lu Yang participated in the 2016 Moscow Biennale, the 2015 Venice Biennale, the 2014 Fukuoka Asian Art Triennale, and the 2012 Shanghai Biennale. 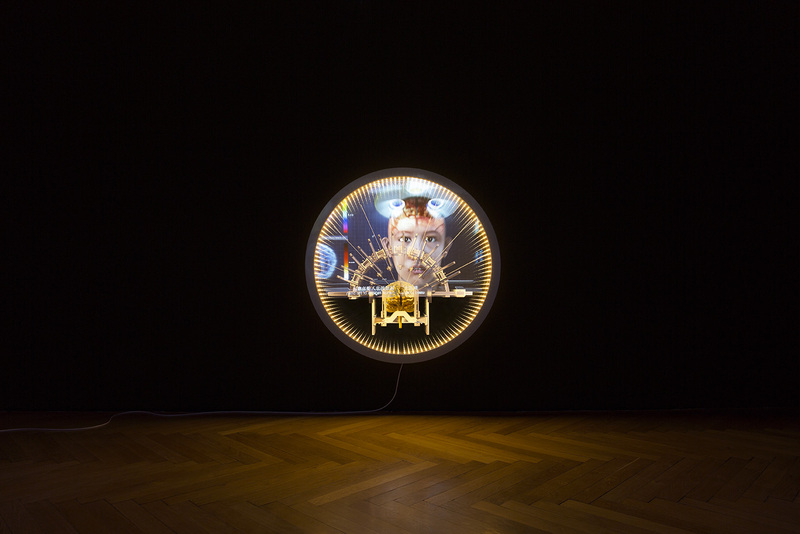 Her work “Uterusman” (2013) was also included in the exhibition “Inhuman” at the Fridericianum in Kassel, Germany. In 2016, she had a solo at her gallery Beijing Commune in Beijing. In September 2016, Société hosted a screening of Lu Yang’s “Delusional Mandala” (2015).